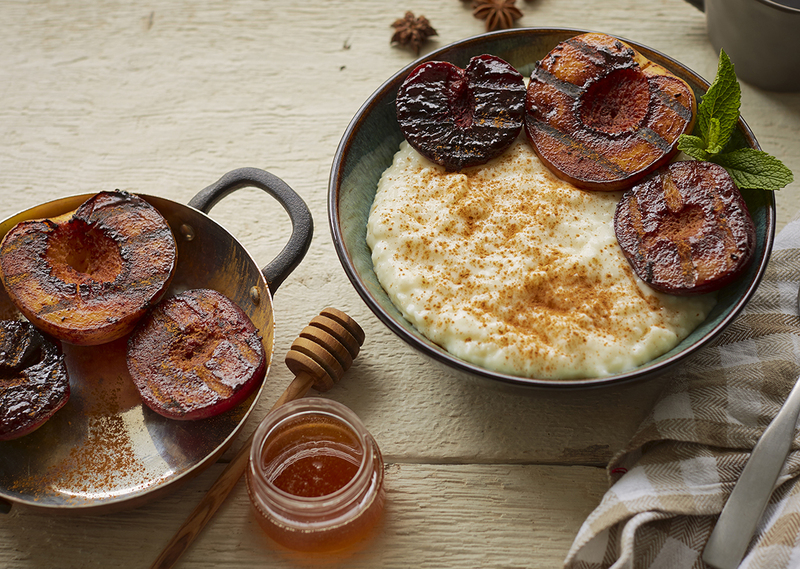 Simply Sweet: Stone fruit becomes even sweeter when grilled and brushed with a honey cinnamon butter mixture. 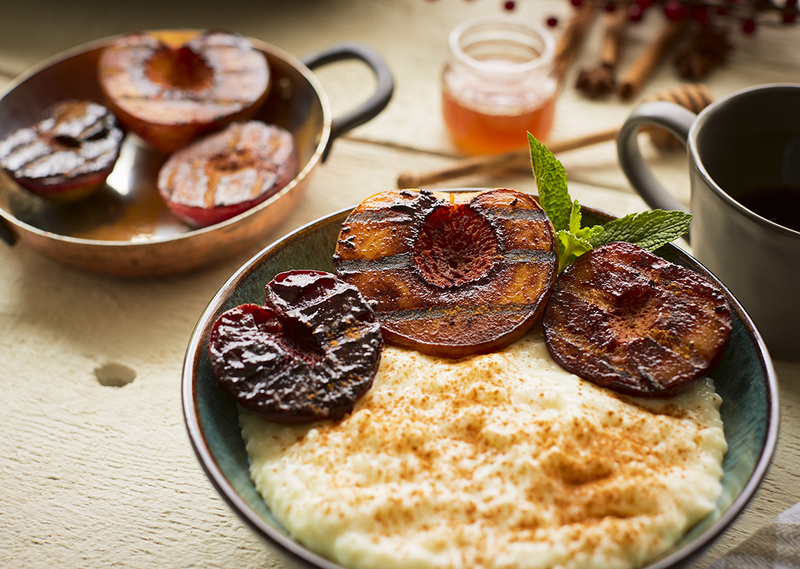 Use this grilled treat to top sweet and creamy rice pudding. In a large saucepan, over medium-high heat, add water, almond milk, evaporated milk, sugar, cinnamon, nutmeg, salt and vanilla. Bring to boil, stirring occasionally, until sugar is dissolved or about 15 minutes. Turn heat down to low and add sushi rice. Stir and cover pan. Cook rice until soft, about 15 minutes. Remove from heat, stir and place lid back on. Rice will continue to absorb liquid. Meanwhile, preheat George Foreman grill by plugging it in, or setting it to MAX, 400°F or setting 4. In a small bowl, combine melted butter, cinnamon and honey. Brush inside half of each piece of fruit with butter mixture and place on preheated grill (butter side down). Brush tops of fruit with remaining butter mixture and close lid. Grill for 10 minutes. Flip fruit and continue to grill for additional 5-6 minutes. Stir rice pudding and pour into a large bowl or platter. 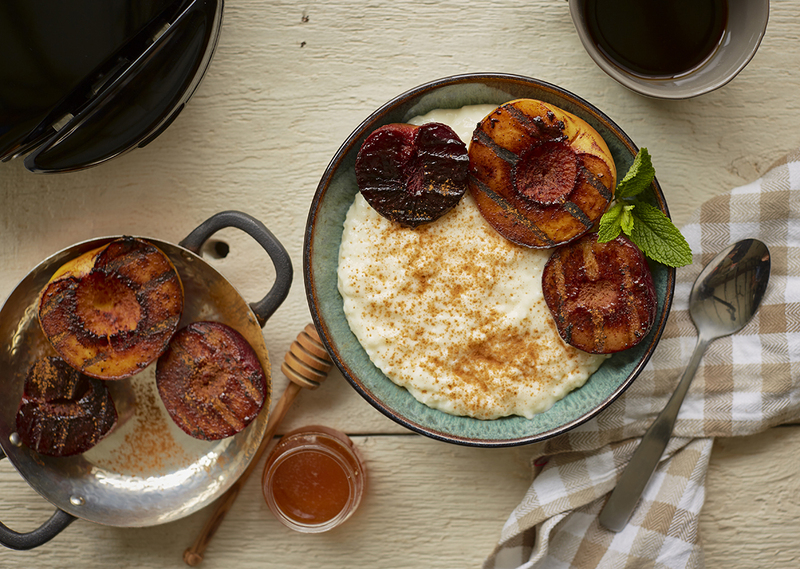 Lay grilled stone fruit on top for family-style dessert.